"Kabir and I are both Gujarati. We had known of each before we met officially on our first date in October 2014. This was arranged through a common family friend who was well acquainted with both our fathers. Kabir and I hit it off immediately on the date at a local restaurant. Today, we are both involved in our hotel business - I work for my father's company and Kabir started his own company with his brother nine years ago." "There was a formal proposal on the day that both our families decided to do a 'Ganesh puja'. I had no idea that the proposal would take place at the event as I assumed it would just be a religious function. Just before the 'puja', Kabir and I decided to do photoshoot in Claremont College in California which is my hometown. We moved from location to location for the shoot, and at one point, the photographer adjusted us in such a way that Kabir was behind me. Then he asked me to turn around slowly to face Kabir. When I did so, I saw him on his knees, holding out a ring and before I could get over my surprise, he asked me to marry him! I said yes - and we held our engagement party that same evening." "We got married at the Hyatt Regency Huntington Beach hotel in California. We chose to wed during the Memorial Day Weekend as it was a long weekend and we wanted our guests to relax and have a good time. For many of them, this was a destination wedding. The hotel was one of the few places that could accommodate our guest list of 800 people for the reception, and 450 people for our wedding ceremony. The hotel is situated right on the beach, so our guests could enjoy the beach activities there alongside numerous shops and restaurants. Our sangeet was held at the Diamond Bar Centre which is a separate banquet facility not connected to the hotel. We had around 600 guests for the sangeet". 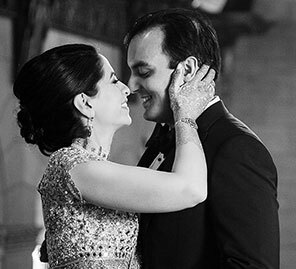 "We had almost a year to plan our special day, and we hired Neha, a wedding coordinator from Blue Lotus Insights, which is a top-rated event management company, to help us as we went along. Our first three vendors we chose were our hotel venue, Duke Photography for images, and White Rose Productions for videography. They were very creative and constantly thought out of the box. They recommended that we have a pre-wedding video which they would incorporate into the video they would show at the reception. We chose Square Root Designs as our florist. I hired Design Visage Studio for my hair and makeup, and was very happy that the makeup artist Ella gave me the perfect look that I desired. I wanted my makeup to be light but still make me stand out as the bride." "I am the only child and last one on my dad's side to get married so my wedding was a big deal for my family. My father took a leading role in planning my wedding and was very particular about how he wanted certain things done - mainly the cuisine and logistics. I looked after the decor aspect of my wedding and worked very closely with the florist to achieve the looks I wanted for my sangeet, wedding ceremony, and reception. Our guests got gift baskets and itineraries for their three-day stay." "Our sangeet had a 'Gujarati garba' theme, and we had different stalls dishing out diverse cuisines, as well as live food stations offering pasta, crepes, and chaat. Singer Preetysha Anjan rocked the gathering with her tracks and the venue was vibrant with a festive and colorful decor." Sneha wore a multi-colored Sabyasachi lehenga for the sangeet to go with the colorful vibe of the 'garba' theme. Her jewellery included a long pendant necklace from Sunil Jewelers in Mumbai. "We had an outdoor wedding and kept everything quite simple. 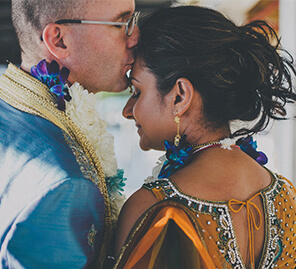 The mandapwith fawn drapes and festive floral arrangements with yellow, orange and pink blooms merged well with the magnificence of the ocean and natural beauty all around. After the pheras, we had a cocktail hour followed by a lavish Gujarati dinner where Preetyshah Anjan again entertained the gathering. She was a huge hit and also sang at my 'bidaai' which made everyone cry. For the 'baraat', we had the Rishi Band which comprises a marching band of white guys who play Indian songs - so this was very different and cool." A regal maroon and gold lehenga by Tarun Tahiliani was Sneha's perfect pick for the pheras. Her choker, 'nath' and 'maang tikka' were all from Sunil Jewelers in Mumbai. "I wanted a romantic theme for the reception, so we draped the entire ballroom with hanging floral chandeliers and long VIP tables along the dance floor and stage, which was quite tall and grand. I wanted the decor for the event to be in blush tones. We also hired acrobat artists who performed their live stunts by hanging from the ceiling - they added a 'wow' factor to the proceedings. They also did a dance performance at the reception. The cuisine for the reception was Punjabi food. Our DJ Ajay Manaktala also handled the lighting needs as owns Special Occasions DJ & Lighting. He's so funny and kept the crowd on the dance floor. He was the best DJ ever and his lights were on point!" 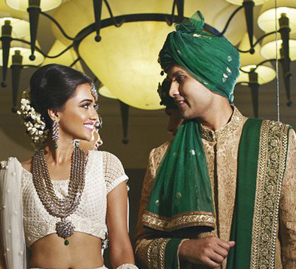 Sneha wore an ivory lehenga with gold threadwork by Sabyasachi for the reception. "I wanted a modern mix look for this event," she shares. Her diamond baubles were from Bhindi Jewellery in Artesia, California. "We had a pre-wedding dessert video shoot, and our videographer, Kabir and I went out to the border of Mexico and California to the Imperial Sand Dunes and had an amazing time shooting there. We tried to capture as much 'live action' there as possible for that 'wow' factor." "Planning a wedding requires a lot of teamwork, knowledge and time. There are plenty of small details that go into staging a successful event like a huge wedding which people don't realize. Also, don't stress about every small detail whether you have your wedding in the US or back in India. Things that you care about will only be of value to you, as the majority of the guests are there to drink and eat and don't even notice that anything is missing. So, have the wedding that you want, not what others wish."